I never bought a watch because someone famous wore it. Although I have emailed and spoken to a lot of people who have a Omega Seamaster Professional or Rolex Submariner because James Bond had one, this kind of behaviour never appealed to me. However, more and more brands seem to attach famous or ‘important’ names to their watches. I would like to make a small distinction between buying a watch because someone famous has one or buying a watch because you got introduced to the brand or type of watch because someone famous has one. 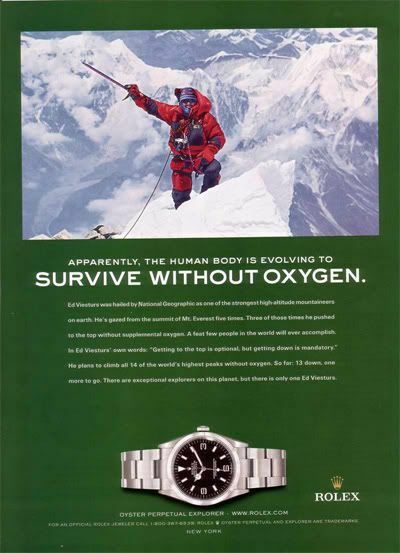 For example, in my opinion there is a difference in putting someone like Ed Viesturs (see below) on an advert for your watch brand or that you advertise with a photo of Brad Pitt (Tag Heuer). 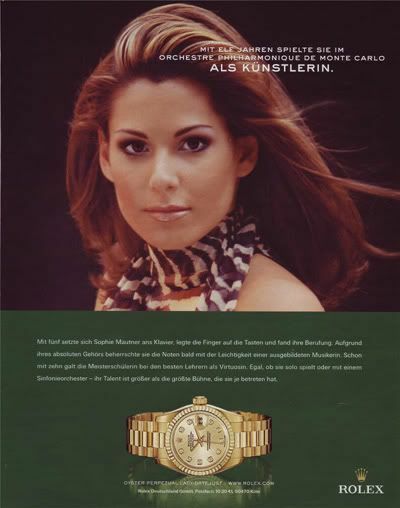 Rolex seems to be the first brand that uses famous people for advertising purposes. Old National Geographic magazines had (and still have) ads like the ones below. Some of the current watch adverts with famous people are really funny. The Baume et Mercier advert with Kiefer Sutherland for example. In one of the series of ’24’ (first season) he was wearing a fake Rolex Submariner.. the B&M advertisement lost its credibility in a split second. Anyway, if you are interested in adverts like the ones below, pay a visit to http://www.oysterworld.de. This site, by Hannes, has a large collection of them.